Our Snowflakes Template Pack adds fifteen shapes that combine childhood memories of paper-and-scissors snowflakes with the endless possibilities that only Kaleidoscope Kreator 3 can offer. Snowflake shapes come in 12- and 16-segment variations and are great for any winter-themed project. Click here to see a free sample project using shapes from the Snowflakes Template Pack. 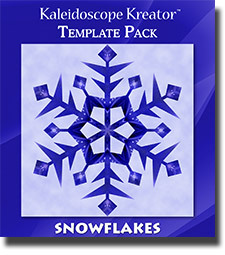 NOTE: The Snowflakes Template Pack is an add-on product for Kaleidoscope Kreator 3, and can only be used if Kaleidoscope Kreator 3 is already installed on your computer.